How much money you need to retire comfortably (and how to estimate it)? Research shows an average retired couple in the UK spends £26,000 annually to live comfortably. What you need to retire comfortably depends on the life you want in retirement. Estimate how much money you need to retire by estimating your needs (and wants) across sixteen spending categories. I know, I know. This sounds like the kind of conversation people have after much drink and to the background of mellow jazz. Still, my friend’s ‘off the cuff’ remark, kept keeping me awake. Problematic reasoning aside, she was correct – how do we really know how much money we need to retire comfortably? We worry about our retirement, seek professional help to figure out our money future and seek the help of dedicated services to track our misplaced pensions. But we mostly accept – and try to make do with – what pensions we have rather than tenaciously build the retirement income we need and want. Do you know, for example, how much money you need to retire comfortably? I didn’t. And if you ask me about the monthly income in retirement we are chasing, I’d be the first to admit it came about because we like the number. Do you know how much money you need to retire comfortably? There are simple ways to work this out. You could, for example, use research on what others spend in retirement as a benchmark. I could tell you immediately that according to research carried out in 2018, couples in the UK spend £26,000 on comfortable retirement (couple also spend £39,000 on luxury retirement that, early on, includes galivanting around the globe). This is not your retirement, however. If you’d like to work out how much money you’d need to retire comfortably, this is how you do it. Trust me, I used this approach and now I can tell you a number because I’ve worked it out; not because I like it. What do you need to spend on in retirement? How much money do you need to retire comfortably? How did you estimate this? Let’s start with the ‘soft’ part of this exercise. Some of you, those who have a more analytical mind, may think that creating the story of your retirement is a blatant waste of time. Without a vision of the kind of life you’d like to live when you retire, you cannot estimate how much money you need to sustain this life. So, I’d suggest you sit comfortably, close your eyes and start dreaming. Where do you see yourself? What are you doing? Who are you with? Where do you live? Do you travel? How does it feel? How do you feel? Write down, or record, your vision of retirement. Let in the ‘critic’ and decide what stays and what goes out of the story. Only after the ‘critic’ has had her/his say you put the story of your retirement to the ‘accountant’. You may find that passing the story of your retirement between the three parts of yourself – the ‘dreamer’, the ‘critic’ and the ‘accountant’ – will shape it into a vision you can make reality. Now we are moving into more familiar, rational, territory. I suppose, the short answer to this question is that you’ll need to spend on all major categories of expenditure except on commuting and any spending associated immediately with working (work clothes, lunches, coffees etc.). Short answers, however, are rarely satisfactory when it comes to detail and variety; and when it comes to planning your spending in retirement it is mostly about detail and variety. You will need to spend on accommodation, property (and related) taxes, energy and water. Thing is that ideally you would have paid off your mortgage by then, downsized so that the taxes and energy bills are lower; can’t do much about the water. You will need to spend on insurance, telephones, internet and TV. Some would say that you could save on those, but they are wrong: the older you get the harder you must work on staying connected to others and the world. You will need to spend on food, clothes, health, transport, entertainment, holidays, some services, hair and cosmetics. Ideally you would have paid off your mortgage off by the time you retire and won’t need to pay for accommodation. All debt must be paid off before retirement. With age the structure of your spending is likely to change: older people spend less on food and drink, clothes and entertainment and more on services and health. You need to factor the costs of care in your estimate of how much you need to live on in retirement. Only one in ten people over 55 in the UK is saving to pay for care in old age; don’t be amongst the nine who don’t. All I said till now about estimating of how much money you need to retire comfortably, you probably could have worked out on your own – I merely saved you the time and effort to do so. Now, I’ll tell you about the things that you probably wouldn’t have remembered; or three key assumptions you must include in your estimates. Age when requiring care: This will always be a wild guess so try to err on the safe side: assume that you’d need care earlier. Care costs and care costs inflation: Current care costs are easy to find; just Google ‘costs of old age care’. It is safe, and prudent, to allow for 5% annual inflation of care costs. As you can see, calculating how much you need to live on in retirement is not a trivial matter. And the complexity only increases when you try to figure out what the amount you need for the retirement you want means for your saving, investing and life-style choices today. Hence, smart people have created retirement calculators. I regularly play with retirement calculators and so should you. Now, there are hundreds of these on the Internet; some better than others. Just Google search ‘retirement calculators’ and test some of them. 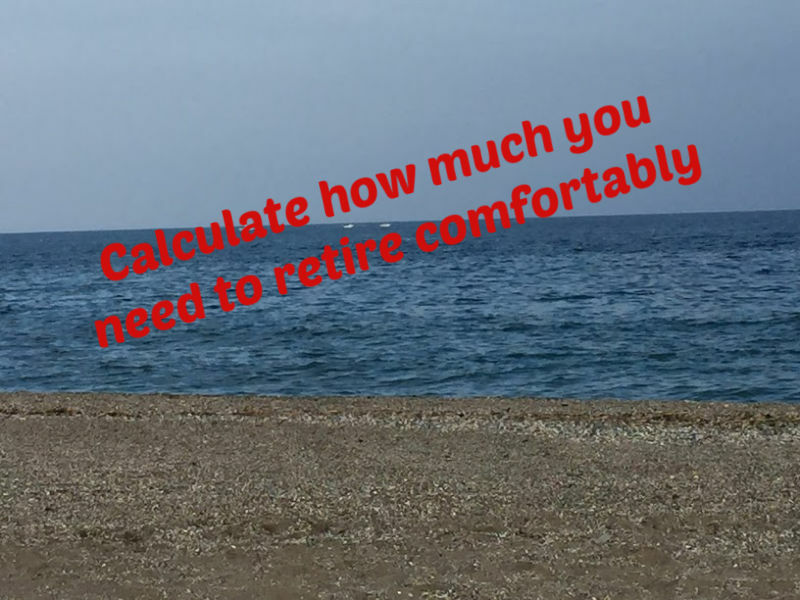 I’m hesitant to recommend any retirement calculators to you because most of them ultimately do the job; it is up to you whether you prefer a simple retirement calculator, like the Profile Pensions Calculator that uses three simple questions to estimate the income you need for a ‘modest’ or ‘comfortable’ retirement (and the pension pot you need to achieve this income), or one of the retirement calculators using more complex assumptions. It’s your call. You could create your own, if you are so inclined – just make sure you use reasonable assumptions. Don’t confuse ‘employment’ and ‘work’: Our notions of retirement are mostly about leaving employment. Today, when 60 is the new 40 (or so I’ve been told), and building on the opportunities that technology affords, there is no reason to stop working even after leaving employment. And working means income; usually. Don’t confuse ‘pension’ and ‘income’: When we grow older, we need income to sustain the life we choose. Building a pension is only one way to generate this income and ‘pension’ is only one financial avenue for retirement. Start thinking of other stream of income. Now that you know how to estimate how much money you need to retire comfortably let me tell you our number. Having played around with my favourite pension calculators…. …I can tell you that to have the life-style John and I want to have in retirement we need £2,800 per month (after tax) or £33,600 per year (after tax). I also know that we’ll have that when I’m 60 (and this doesn’t include investment income). Editors note: This post was developed in collaboration with Profile Pensions.